After studying in Berlin and USA, Christine Schmalor worked as a freelance director until she turned to practical research of acting methods and teaching. 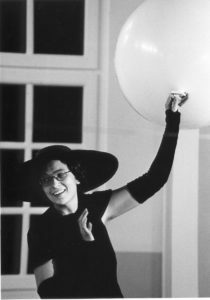 Together with Dr. Jurij Alschitz, she founded the International Theatre Centre AKT-ZENT in 1995 in Berlin, today known as the World Theatre Training Institute AKT-ZENT / ITI. As programme director since 1995, she develops and conducts European and international collaborative theatre research programmes; currently The World Theatre Training Library / Laboratory and M.A. programme Teaching Professional Theatre Practice. As researcher, she is responsible for the curriculum development of this Master Degree and the methodological documentation of the Institute’s work results. She built the first hybrid theatre platform for online education launched in 2017. As trainer, she teaches in the Team of Teachers of the European Association for Theatre Culture (EATC), and at various academies. As editor, she launched „ars incognita” which publishes theatre teaching books, with the aim of creating a forum for practical theatre research. Editor of the teaching handbooks of Jurij Alschitz. As networker for cultural affairs, Christine Schmalor served first as vice-president, and later from 2004-2011 as president of the ITI – Theatre Education & Training Committee. As expert, she participated in international congresses on theatre education; was invited as speaker or as adviser for the Bologna Process and as jury-member of international theatre school festivals.